The Senators trip to Raleigh, NC and their quest to regain 1st place in their conference was Staaled by Eric and the Hurricanes on Sunday afternoon. I'm a dyed-in-the-wool Sens fan (have I ever mentioned Mike Fisher?) 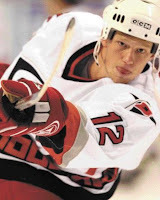 but I also like Eric Staal so when he garnered 3 assists in the 'Canes 5-1 win over the Sens, it took away some of the sting. Eric is having an excellent season and has done extremely well in the last few games. ...not to mention that 80% of the goals scored against the Sens came from two former Sens, eh?! My sister was wondering...did you take that picture ;) That is a beautiful pic for sure. Please thank Eric Staal from my siblings and I for ensuring that the Habs will remain in 1st place in the divsion for another day ;) I was so sure that the Sens would win last night, to be honest. This is the most exciting stretch of games until the playoffs that I can ever remember since I began following hockey.